The third book in Joey Weiser's Eisner Award-nominated series is now in paperback! No one knows much about Mer, the underwater kingdom where Mermin the merman was born, but due to a rising conflict with the people of Atlantis, Mermin needs to get back home immediately. Which means his human friends get to accompany him and see all the aquatic wonders of Mer. But once again, Mermin is tight-lipped about his past―even when it's swimming right in front of him. And there are enemies lurking in the seedier depths of Mer, who've got their sights set not only on Mermin, but on Pete and his friends! 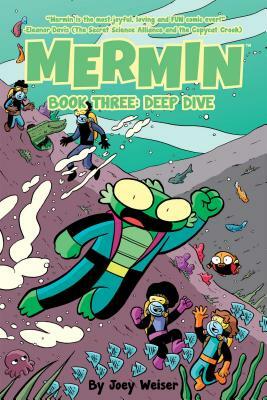 Joey Weiser is the author of the Eisner Award-nominated MERMIN graphic novel series from Oni Press. His comics work ranges from writing and drawing for SPONGEBOB COMICS to coloring the JEDI ACADEMY: A NEW CLASS series. His first graphic novel, THE RIDE HOME, was published in 2007 by AdHouse Books. He is a graduate of the Savannah College of Art & Design and currently lives in Athens, Georgia.